Our Hong Kong face, Sala Sihombing attended one of the first events organised under the banner of 'dialogues in dispute resolution'. Katherine Lynch (pictured left) organised the collaborative public dialogue exercise in conjunction with the Ocean Recovery Alliance in order to highlight the powerful possibilities of using dialogue to deal with difficult issues. The public dialogue was held at the Stock Exchange of Hong Kong and was well attended. 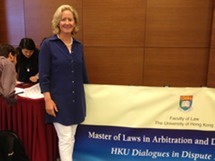 Katherine is an Associate Professor and the Director of the LLM in Arbitration and Dispute Resolution at the University of Hong Kong.